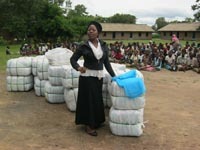 149,500 nets are now being distributed in Balaka district, Malawi. All nets will be distributed by the end of October. These nets will achieve universal coverage of all sleeping spaces in the district of some 388,000 people. Pre-distribution work led by our distribution partner, Concern Universal Malawi, and carried out with the local government health teams, has involved visiting all 90,336 households in the district to establish net need per household. This allows an efficient, targeted distribution with each household receiving the number of nets each needs. This pre-distribution activity allows significant engagement of community and health leaders in the net distribution process and associated malaria education elements. Community involvement is instrumental in ensuring an organised distribution and helping to achieve high levels of immediate net hang-up and sustained use. Detailed distribution records, including household level data, will allow us to verify nets were distributed as intended. Independent supervision at the ‘moment of distribution’ ensures no nets are misappropriated. The data collected during the pre-distribution phase will be used in the six-monthly post-distribution net use and condition check-ups, when 5% of households are selected at random and visited unannounced to gather net use and condition data. These (anonymised) data are made public, allowing us to report on the levels of net use achieved over time. The District Health Officer (DHO) and his/her team are able to use this health-centre level information to influence additional local malaria control interventions as they deem necessary.